Oh, my son. My baby. My youngest. My three-year-old. He's smart, silly, sweet, loves books (his favorite being The Hungry Caterpillar), and builds the most creative things. He is also not meeting his speech milestone. I've internally noticed for some time that his speech is not as clear as his sister was at that age either. By now, his speech should be mostly understood by strangers. To be honest, I have a hard time understanding him sometimes. I have a video of his sister singing the theme song to Disney Channel's Jesse, at 3 years and three months. She is clear as can be. I thought he's a boy and word is they take a little longer, right? But I have friends who have boys and they were talking clear 6 months ago. Then, I began to get anxious. My youngest brother (who is actually just a year younger than my daughter) is autistic. He did not meet many milestones on time, such as walking or talking. I asked my mother about it too. She has a hard time understanding my son in video chats. One morning during drop-off, his teacher approached me about his speech. I told her I had felt he was having difficulty in that area as well. She said that he would be evaluated by a speech therapist there and that they have a program to help if he needs it. Then the time came for the standard parent-teacher meeting where we would see how he's adjusted, how he's doing with the activities and where he needs some improvement. He was adjusting well, keeping up with the activities and having a ball. A few minor issues like sitting still and manners but nothing worrisome, EXCEPT his speech. Her recommendation was that he go to the program. No cost and not a big interruption to his day. There were many children recommended for the program and they would be pulled out of class as a group and do phonics type activities that seemed like games to them. I signed the consent forms. Fast forward a few months, and his speech has improved a lot (which means it was so bad) because we still have a long way to go. There have even been a few big words spoken that amaze me. However, his teacher approached me today and said that while he is clearer, he may need some additional support outside of school. A speech therapist listened to him earlier this week and noted some issues. There's a possibility his speech difficulty may be caused by his hearing. He will be evaluated by the school again and may get referred for hearing tests soon. I am a little disappointed that more could be in store for my little man but I am hopeful. In the meantime, we began Hooked on Phonics and will be working on that the days he is home with me. Do have grace with yourself. There's nothing you could have done in utero. I have caught myself thinking "what did I do differently with this pregnancy than with my first." It's a useless and shame-producing thought. Don't even go there. Do be patient. Getting upset, especially with the child, won't make them get it any faster and can cause emotional damage. They don't know that they are any different than the other kids. Mine thinks he's clear as can be and gets upset when we ask him to repeat a few times. Do get help and resources ASAP. The sooner the intervention the better. While I'm sad he may need more help, whatever I can do in my power to help him, I will. Do let your other kids know (age appropriately). In order to avoid any unintended hurt, I've let my daughter know about his speech difficulty. She knows to be more patient and attentive when he's talking. It was easier to have our talk because we've already had a conversation about autism and my brother. 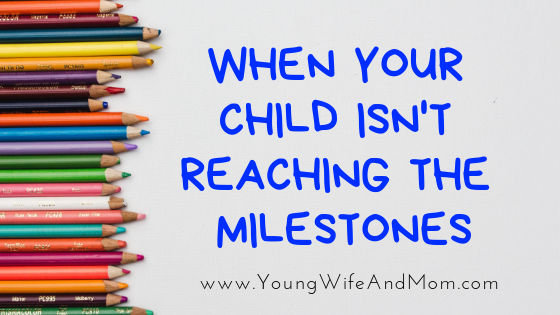 Do be hopeful that your kid will make that milestone eventually, and then the next and the next! Be their biggest supporter. Have a similar story or resources to share? I'd love to hear it. Feel free to email me or leave a comment.